About six months ago I found myself wandering through a needlecrafts exhibition, admiring the rows and rows of pretty things, all perfectly placed to draw the eye to temptation and make the purse clasp spring open. Whilst I was rummaging among the wares of one particularly beautiful stall a bolt of bright fabric caught my eye. It was a double border print featuring cartoon images of a very vivid woodland squirrel scene. I enjoyed looking at it a long time as my mind quickly sorted through the possibilities of what I could possibly make with it as images of skirts, dresses and various tops flashed through my mind. But then someone asked ‘yeah, but you wouldn’t actually wear something you made from that fabric, would you?’, and I though, yes, maybe they were right, it perhaps was a bit silly, and maybe I would never wear it, and it was expensive, and maybe I should leave it. So, I walked away, leaving the fabric on the stall. But even as I got back to the car I was thinking about that bolt of fabric, and the accompanying piece of fabric that I had found that matched the jade background print. My mind built on the things I could have made from those fabrics all the way home, where I resigned myself to the fact that I did not purchase it and would dwell on it no longer. However, over the months that followed I couldn’t get the thought of the fabric out of my mind, and eventually I started an internet search to find out what the fabric was called, who designed it and if I could find somewhere to buy it from. Maybe if I could one day find the fabric then maybe I could one day make something from it. Eventually I managed to hunt it down: Michael Miller’s Nuts For Dinner, along with the coordinating small-tile fabric. I purchase 1.5m of the border print and a single metre of the Tiny Tiles print and very patiently waited for it to arrive. When the fabric was delivered to my workplace in a little pink package I carefully opened it with just a little trepidation at my wonder of whether it could possibly be as awesome as I remembered. It was. Then came a period of me being too scared to cut into the fabric, especially as I needed to shear the border print straight down the length to separate it into two lengths of border. However, last Sunday, elated by the joy of a friend’s wedding, I decided that it was only fabric, amend the worst that could happen was that I never actually used it. 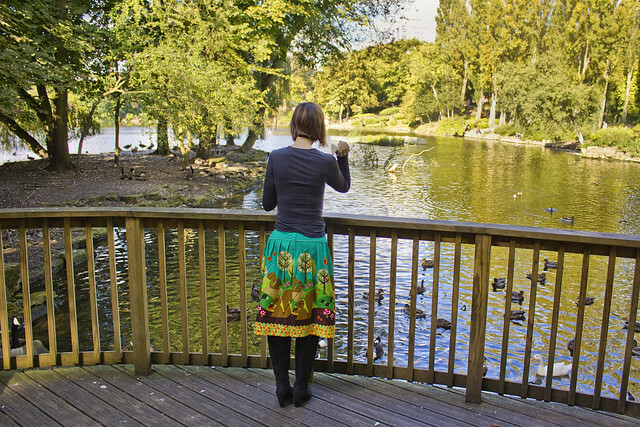 So, putting aside those words that I would never actually wear anything I ever made from the fabric, all caution was thrown straight to the wind and I decided to make myself a skirt. 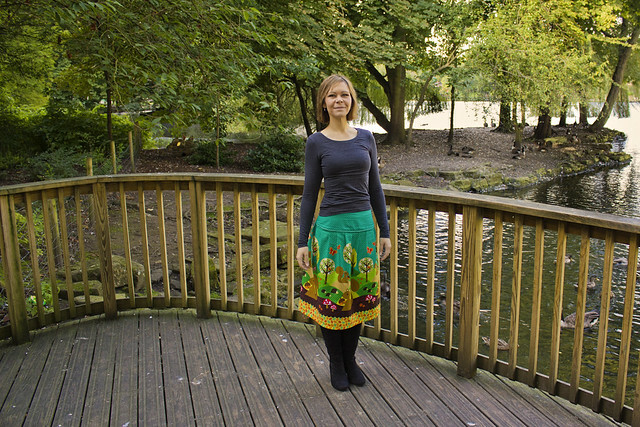 Now, I am a very novice seamstress, and this far I have only made one skirt – an A-line design which I do have to admit I absolutely love. However, when making that skirt I noted the geometry needed to create the a-line shape which leads to needing a curved hem to keep the drop equal all the way around. Other than cut the beautiful continuation of the print into panels, so spoiling the uninterrupted scene, I thought the best way to maintain the fantastic leaf border in an equal depth all the way around the skirt was to make a pleated or gathered skirt. I designed a little yoke piece for the front of the skirt to give a flat front to sit on my waist and hips, and then I worked out my pleat pattern and just decided to go for it – I’d be using less than half the amount of each piece of fabric, so I could always have another shot of it if I made a mistake that required so. 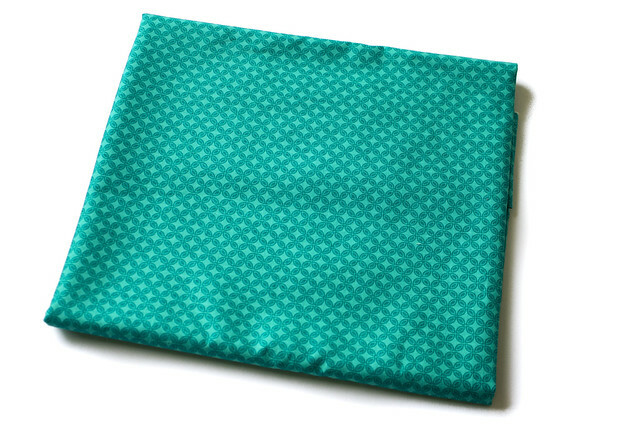 I LOVE it, you did a great job working out the border print – pleats are better than gathers. and anyone who would worry about wearing a thing as awesome as that in public is too boring for words. You have vision and style! I’m glad you were able to track down the fabric. You did a great job! 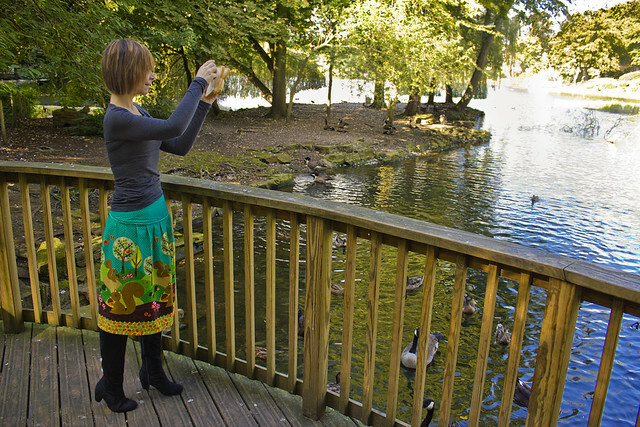 Ohmygosh, yes, everyone should be wearing things as happy and fun as that skirt! Super cute! And the understated silhouette really allows the fun print to shine. You look lovely wearing it! How wonderful! You did a great job on this one. I wish I had your skill. I’m still trying to get the hang of a straight line on my machine, so for now I’m sticking with quilt tops. Maybe one day I’ll be on your level! Gorgeous! Looks fantastic! Now… what are you going to do with the leftover fabric? 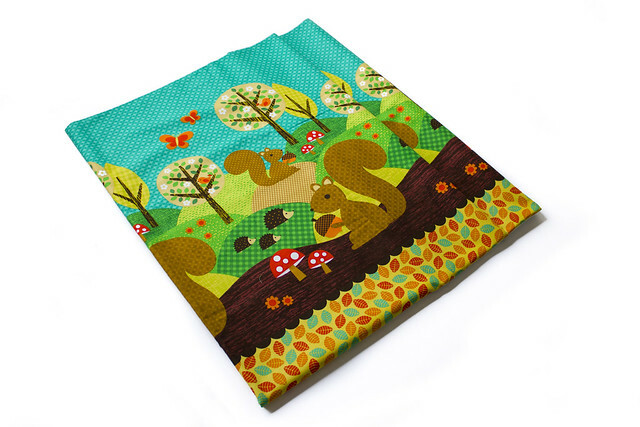 If you love it, it is definitely YOU and nothing is going to look as good on you as those very things that put a spring in your step and a smile in your heart, like that cheerful squirrel design. It looks fabulous! 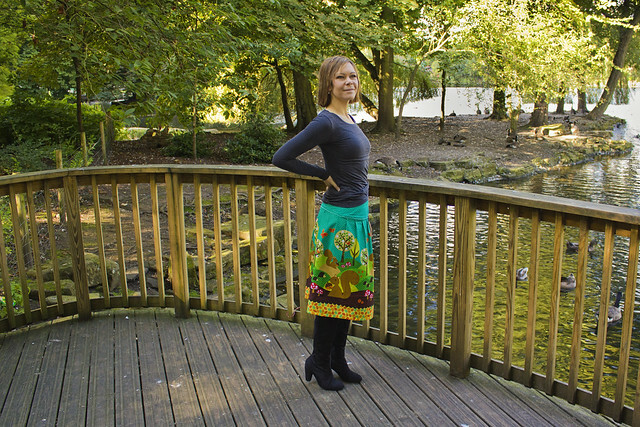 You have made a wise choice about the skirt style to bring out the best in the fabric patterns. Well done! I absolutely love it. I am a bit reserved in my clothing choices, as my recent declutter of my wardrobe showed I tend to have red, black, white, grey and purple, and not much else. You always inspire me to have a go at something new, I shall get some colour into my life pronto!